Normally, you'd expect Boys' Friend Library issues from the 1930s to go for around a fiver apiece but 1935 was a little different. 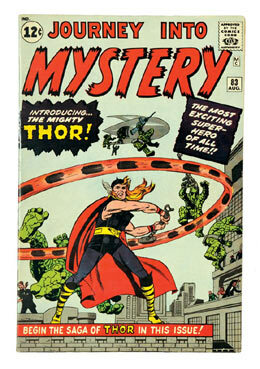 Offered in one lot of 36 issues there were two titles concerning a certain Flt. Lt. Bigglesworth that were published for the first time. 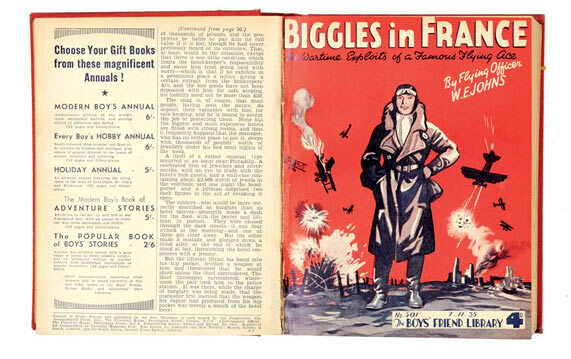 Biggles Learns To Fly and Biggles In France created huge interest amongst our collectors, especially as they were publisher's file copies and bound in 3 volumes. A high flying bid of £843 secured them. 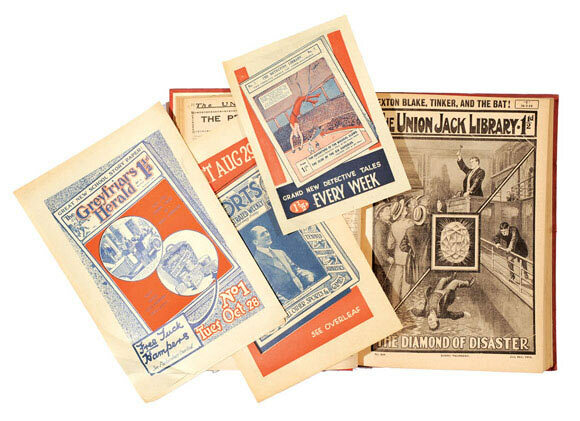 Sexton Blake is still the detective of choice for many bidders and the Union Jack Library was exclusively filled with his adventures in the early 1900s. We offered the complete year for 1919 bound in two volumes and this lot included flyers for three titles introduced that same year: Boys' Cinema No 1, Greyfriar's Herald No 1 and All Sports No 1. The case was solved for £440. Early 1920s story papers were printed on basic paper stock so printing inks faded quickly and the impurities in the paper led to premature page tanning. As if this wasn't enough to deter enthusiasts of the genre, staples were made of untreated tinplate, their short shiny lives degrading to rust even at the mention of the word 'moisture'. 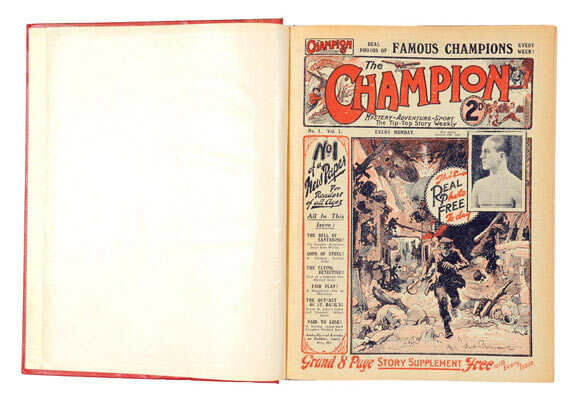 Thankfully bound volumes can bypass these natural mishaps and The Champion 1-49 from 1922 were taken to £330, arms aloft. 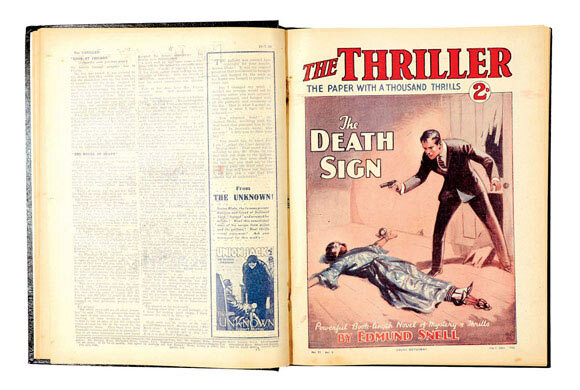 1930s Thriller issues often contained stories by Edgar Wallace and Leslie Charteris and the complete year of 1930, once more in two bound volumes, raised a saintly £208. 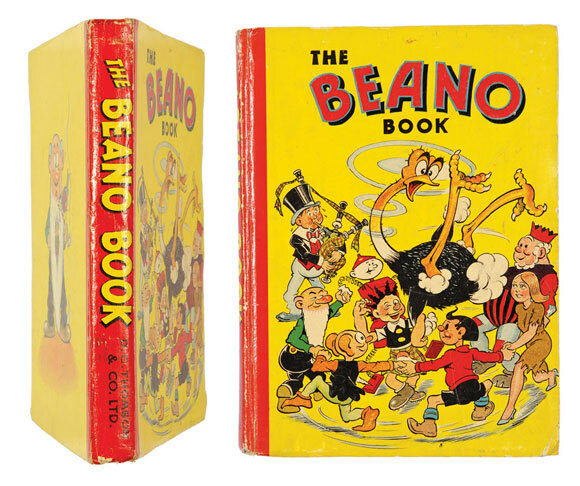 The Beano Book for 1942 is on many collectors' wants list and our Very Good Minus copy was strongly contested, Big Eggo Highland flung to £1100. 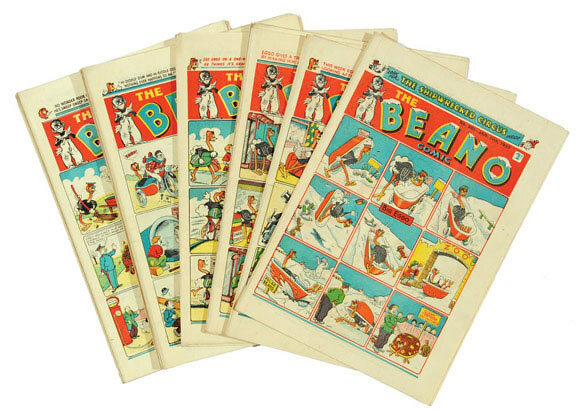 Later war years Beano and Dandy issues were also out in force and generally marched to previous prices of £50-60 each in higher grades. Here we are in 1941 with Jock McSwiper (The Dandy Piper) ingeniously using his bagpipes as anti-aircraft guns and air raid sirens to down a Nazi raider. This original artwork bagged £253. 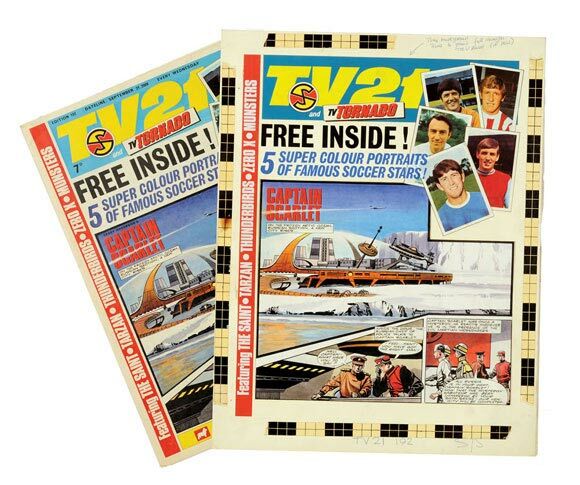 Offered in a complete year of 25 fortnightly issues, These Beanos in Fine/Very Fine grades starred regulars, Big Eggo, Lord Snooty, Pansy Potter, Jimmy And His Magic Patch and The Shipwrecked Circus, not forgetting the introduction Alf Wit The Ancient Brit. £881 brought him up to date. 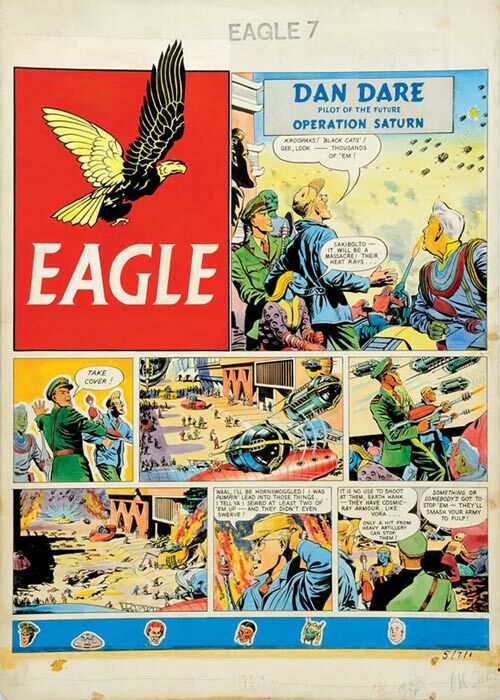 Eagle's Operation Saturn front cover from 1954 dealt with an intrepid defence of the allied stronghold by Col. Dare's rebel forces, pitted against the might of Vora, Blasco and The Rootha's cosmic-ray-armoured Black Cats, (please keep up at the back, or you'll be kept in after school), all brilliantly illustrated in Desmond Walduck's original artwork. £561 ran rings around Saturn. 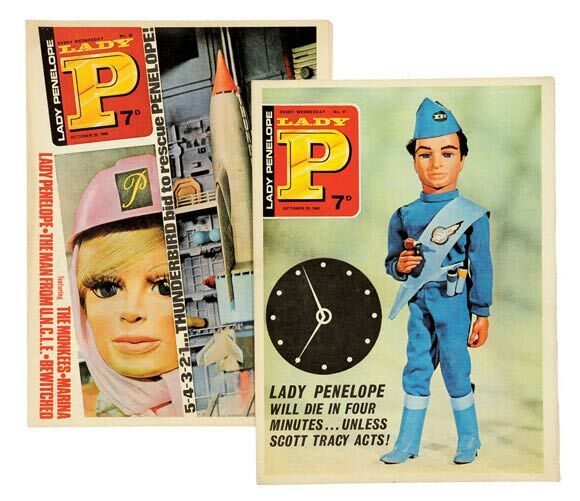 As well as being effortlessly elegant, Lady Penelope is also hard to find. We were honoured to offer most of her first hundred issues in 17 lots. No 1 made £101, early issues ranged from £22-50 each and later copies sold in the teens - all totalling £1433.00. Fancy a nice cuppa tea, m'lady? 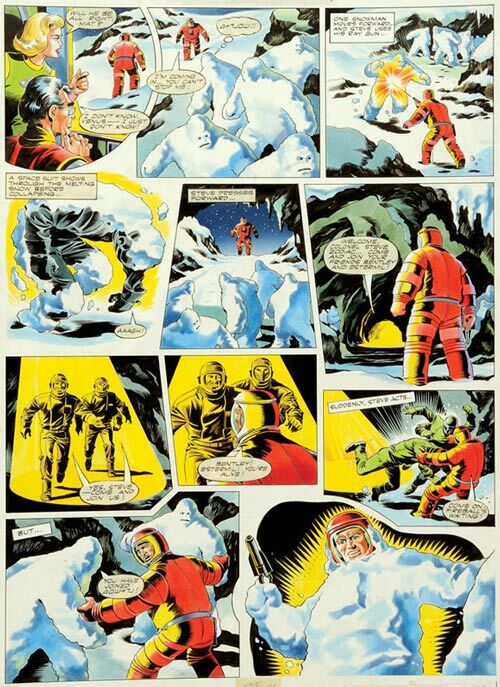 Frank Bellamy's Captain Scarlet artwork for TV 21 was bid to a bright red £797 and Mike Noble's board of Fireball XL5 for the same comic kept pace with an explosive £715. 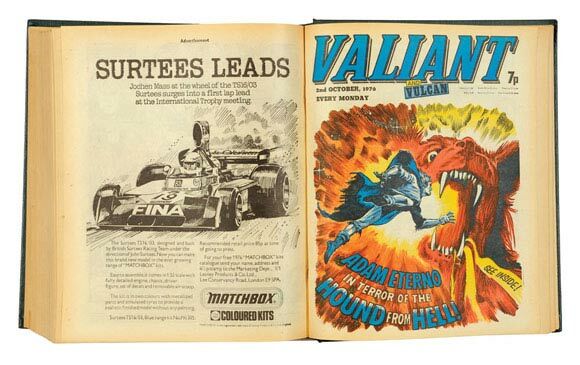 Here were eight bound volumes of Valiant (1972-76) comprising some 250 consecutive issues right up to the last. Guide price was £150-200. Captain Hurricane, One-Eyed Jack, Return Of The Claw, Star Trek and Death Wish stories combined to produce a staggering winning bid of £1650. The Seventies are beginning to come of age, but only in the highest grades. 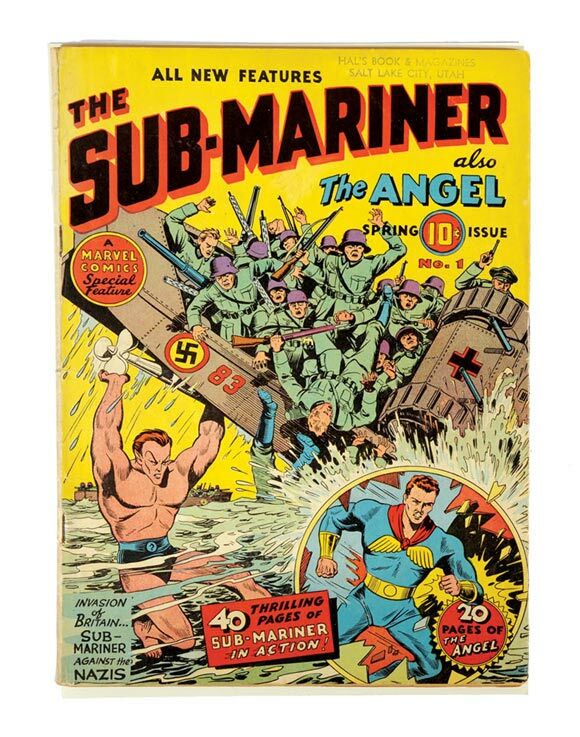 Our US Golden Age section launched a rare copy of Sub-Mariner #1 where Namor was contented with a slightly below estimate £2300. This particular copy had some sellotape to the centre pages where they had worn through the staples and the seascape cover was suitably enhanced by a Salt Lake City dealer's stamp. 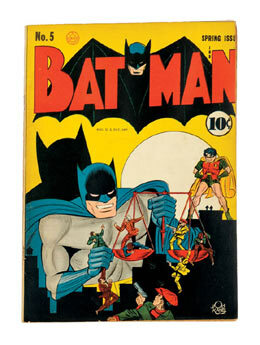 Batman #5 from 1940 introduced the first spin of the Batmobile, parking with a lower gear £550 from its £600-700 estimate. 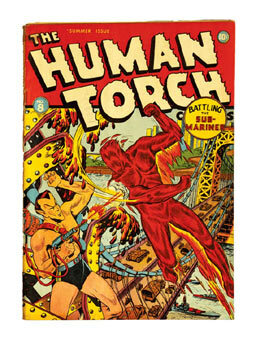 However, The Human Torch #8 stayed on the front burner with a mid range £305. The second tranche of our large single-owner Silver Age collection sold all 132 lots with Fantastic Four well represented. 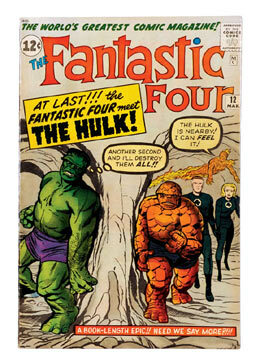 Issue 12 lifted a hulking £990 and the guest Surfer's #48 checked in with £1045, CGC graded at 9.4. 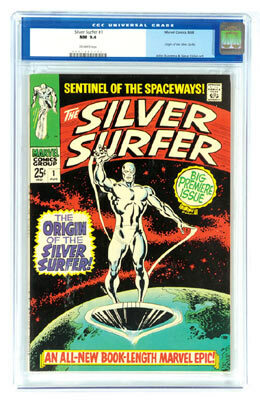 Now starring in #1 of his own title, The Silver Surfer rode the pipe to £863 whilst Thor's first appearance journeyed firmly to £1,650. Our Prices Realised section details all 426 lots from our March auction catalogue. Just check under Spring 2009. 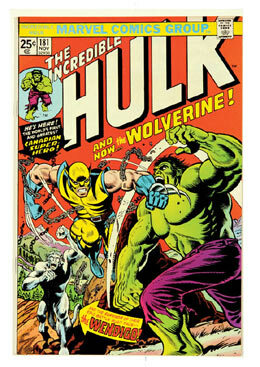 This dog-eared Hulk #1 stood up to a Good £319 and thirteen years later his seminal 181 battled Wolverine to £465 exemplifying green energy. British comics prices are holding up very well in this economic recession so far and some of our customers have told us that they feel better holding these items over the medium term than other forms of investment. My own view is that one should tend to have a balanced portfolio if you're fortunate enough to have a balance to portfolio with in the first place. A few shares, some diamonds, a clutch of wartime Beanos, a couple of Whizzers with your chips, you know the sort of thing. The American market is also resilient. 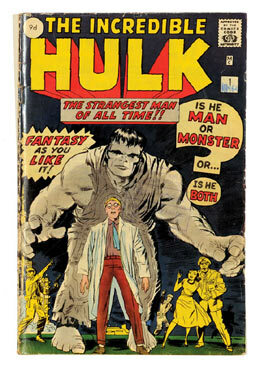 The Silver Age (1960-70) is strong with the later Bronze Age coming into maturity. 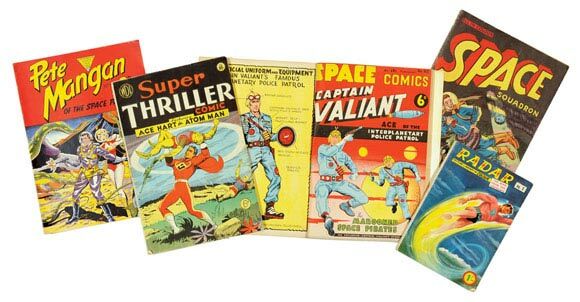 The Golden Age (1936-54) is less buoyant generally, but this may be more to do with an ageing collector base rather than the current malaise. None of this applies to rare first issues, however, as they have a dynamic all their own. Superman's first appearance was in Action Comics #1 and an example was offered for sale in America on March 14th. 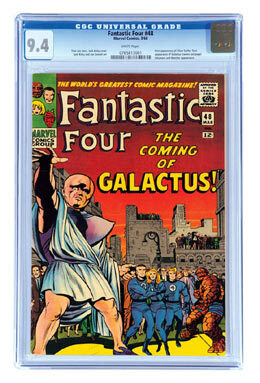 Encased in plastic and CGC graded as Fine 6.0 it was contested by over 80 bidders to a winning total of $317,200 - that's £226,500.00 and change. The seller had noted prior to the sale that it might fetch $400,000 so I hope he wasn't too disappointed.